inne les than I putte hir among men. " As a genre of embodiment and literature, hagiography creates continuity through diversity. Evident generic features exist across time but are embodied uniquely and personally. Each saint may be said to be set apart Imago Dei but each image is distinct. Likewise, the Imago Mundi that the saint turns away from changes over time. Each saint may be a model for Imitatio Christi, yet lived in different ways and circumstances. Thus, while lives and stories may be composed in association with trans hagiographic texts, the process and ends of each may be unique. 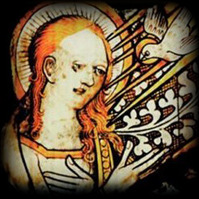 Thus, whether or not Margery Kempe is recognized as a saint by the Catholic or Orthodox churches, nonetheless her Book constructs a hagiography that clearly models Kempe according to saints and sections of the narrative according to saints’ lives, following in the tradition of Imago Transvesti and Imitatio Transvesti as modeled by “the Life of St. Marinos the Monk.” Between 1413 and 1415, Kempe is traveling through the Holy Land and Rome, during which time she is given a persistent Imago Transvesti. In a vision, she is living as a trans virgin, transforming the image of herself from a mother (as the world has assigned her to be) to a virgin (as God commanded). The transition from mother to virgin is embodied not only by the exchange of clothing, dark colors for hues of white, but from the locomotion of the travel. Quite literally, on the road she is more free and boundaries of identity more fluid. 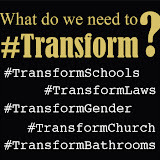 Also, Jerusalem and Rome, the centers of Christian world, function to re-center the trans saint. 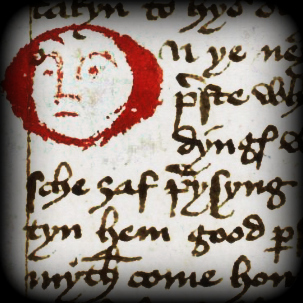 In England, often shown on the margins of the medieval Mappa Mundi, Kempe is marginalized for her revelations from God and later for her trans virginity. Moving from the margins to the center coincides with her movement from the Imago Mundi, the image of her worldly self, to the Imago Dei, God’s image of her. Around the summer of 1413, the Imago Transvesti is given to Kempe in a vision, wherein God commands her to go on pilgrimage, promising her freedom and protection if she will mark herself as an Imago Dei by wearing white clothes. God commands, "dowtyr, I sey to the I wyl that thu were clothys of whyte and non other colowr, for thu schal ben arayd aftyr my wyl" (Daughter, I say to you that I will that you be in clothes of white and no other color, for you will be arrayed after my will). White clothes on a woman are a medieval signifier of virginity. Kempe worries over her embodiment; marked by years of childbearing. 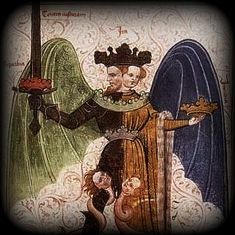 While Genesis 1.27 asserts that God creates humanity in a divine image, including gender, "creavit Deus hominem ad imaginem suam ad imaginem Dei creavit illum masculum et feminam creavit eos" (God created mankind in his own image, in the image of God he created them; male and female he created them), the medieval Imago Dei must combat the Imago Mundi and the gender culture assigns. Wearing white, Kempe would be insisting that the Imago Dei that God has set in her heart (virginity) is more true than the truth assigned to her body (motherhood). The motherhood may have been the will of her husband and the world, but the virginity is the will of God. The radicalness of this supernatural command is evident in the phrase, "whyte and non other colowr." God is clarifying that Kempe would be taking on the identity of a virgin and rejecting her identity as a mother. The color of the one identity will not be seen in the other. The function of clothes is to assert identity markers in ways that usually hide or overrule the body. The body may be suggested but not seen when clothes is covering it. No word is given from God that her body will be changed but rather its meaning will be reassigned and overruled by the clothing. The Imago Transvesti often contradicts the assigned genders of the world. For fear of embodying this contradiction and the battles her body would have to suffer as a result, Kempe pleads to God, "A, der Lord, yf I go arayd on other maner than other chast women don, I drede that the pepyl wyl slawndyr me. Thei wyl sey I am an ypocryt and wondryn upon me" (Dear Lord, if I go arrayed as a virgin, I dread people will slander me. They will say I am a hypocrite and stare at me). A medieval woman, Kempe is aware of how clothing signifies distinct gender identities, between men and women, as well as between women. Virgins wear certain clothes to identify themselves, wives others clothes. To wear white clothes would be to declare that she is a virgin. One may transition from the identity of virgin to mother but not from mother to virgin. Kempe fears the scorn that comes from such a transition, particularly being a hypocrite. A hypocrite is one who says they are one way and behaves in another way. If Kempe says she is a virgin but has given birth to children, others will say that she is this special kind of liar. Yet this is what God commands in showing her this vision. "Ya, dowtyr," God says, "the mor wondryng that thow hast for my lofe, the mor thu plesyst me" (Yes, daughter, the more they wonder at you as you live the life I command, the more you please me). God is showing her a true revelation of herself as a virgin. So far, this Imago Dei is only visible to her. To embody this Imago Tranvesti, like other trans saints, she would be taking a risk of becoming a target. Yet by embodying the invisible truth of the Imago Transvesti, set apart as a trans saint, Kempe is making the Imago Dei visible to the world. She will be revealing the Imago Transvesti to others as God has revealed it to her and make the world consider the diversity in God's creation. Wanting to test the truth of the Imago Transvesti as Imago Dei, Kempe delays for a time until she can get validation of her revelation from the Church. Around 1413, she seeks Bishop Repingdon to affirm the command for her transition. Hearing her plea to wear white as a virgin, the Bishop gives her a discouraging response, " I have take my cownsel, and my cownsel wyl not gyf me to professe yow in so synguler a clothyng wythowtyn bettyr avysement" (I have considered with consul, and my consul will not allow me to affirm that you should wear such clothing without better advisement). The repetition of the word "consul" affirms how Kempe's Imago Dei is elided, marginalized, and bound by the discourse of the world. Society affirms that she is a wife and mother. Social norms are that mothers do not wear white. The Bishop is not willing to take a risk on an Imago Transvesti that he cannot see and contradict the Imago Mundi he can see. Where the Bishop keeps the question open is in allowing Kempe to go on the commanded pilgrimage that she might prove the truth of her Imago Dei by living it. The Bishop allows, "ye sey be the grace of God ye wyl go to Jerusalem. Therfor prayth to God that it may abyden tyl ye come fro Jerusalem that ye be bettyr prevyd and knowyn" (You see by the grace of God that you will go to Jerusalem. Therefore pray to God that you may abide until you come back from Jerusalem with better proof and knowledge). 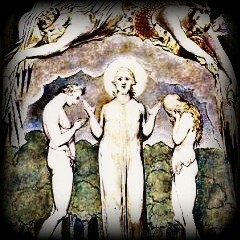 Pilgrimages by their difficulty were used as tests of unseen graces. Like how many trans persons describe transition as a journey, the work of turning the invisible Imago Dei into a visible embodiment takes time and effort. In other words, the Bishop insists that he will only believe what he can see. If Kempe embodies and lives the narrative of trans virginity on pilgrimage, the Imago Transvesti will be given a form the Bishop cannot deny. The vision of the Imago Transvesti can be revealed, transitions are often not a smooth process full of starts, stops, and set-backs. Kempe does set off on pilgrimage, yet not until the summer of 1414. Rejected by fellow pilgrims, Kempe prays to for help. In reply, God again gives her a command and a vision of herself as a virgin, " I schal ordeyn for the ryth wel and bryng the in safté to Rome and hom ageyn into Inglond wythowtyn ony velany of thi body yyf thow wilt be clad in white clothys and weryn hem as I seyd to the whil thu wer in Inglond" (I will ordain your wellness and bring you safely to Rome and home to England without any violence, if you will wear the white clothes I instructed of you while you were in England). As is common in saint's lives, Imago Dei arrive when saints are at their most vulnerable. Rather than being a threat to her wellness, the Imago Transvesti becomes the mode by which her wellness is ordained and assured. The trans saint of this hagiography, Kempe accepts the invisible truth of the Imago Transvesti, although she fears she will now be called a liar and hypocrite. To this worry, God assures, "I am the spirit of God... Thu fondist me nevyr deceyvabyl, ne I bid the no thyng do but that whech is worshep to God and profyte to thy sowle yyf thu wilt do theraftyr" (I am the spirit of God... you found me never deceptive, now I bid you nothing but what is good to God and profitable to your soul if you will follow me hereafter). Often trans persons are accused of being in disguise, yet their insistence of demonstrates authenticity over time. Saints are called hypocrites for contradicting the way of the world, but are vindicated by the end of their stories. Marinos is rejected by his community on charges of hypocrisy, yet he is vindicated in the end by God. Marking Kempe as such a saint, God promises Kempe that her story will follow likewise. There is a critical difference between the truth of Imago Mundi that it is made and reasoned from other true things while Imago Dei are revealed by the Creator of Logos. If as Augustine writes in "De Trinitatae”, “in the soul of man… [is] that image of the Creator,” then the truth of the Imago Dei within Kempe is true although it is not yet seen. If she embodies the Imago Transvesti, the charges of inconstancy will fall before the constant image of truth God makes of her. The promises of God and creature found in the Imago Transvesti prove true over the course of the pilgrimage from Jerusalem to Rome. Shortly after praying and receiving the revelation of the Imago Dei once again, Kempe discovers an Irishman with a bent back who speaks English named Richard. Although he is uncertain of the truth and wisdom of the Image she shares with him of their journey, Kempe is able to convince him through her persistence and insistence of God's truth. Occurring in private revelation remains consistent, yet delayed until Kempe changes enough in person and circumstance to be able to transition. To the surprise of many, including Richard and the group of pilgrims who had abandoned her in Jerusalem, Kempe and her friend arrives safely in Rome. There, Kempe commits to being constant to her word as well and makes moves to transition. When in Rome, Kempe ordered white clothes and wore them "as sche was comawndyd for to do yerys beforn in hir sowle be revelacyon, and now it was fulfilt in effect” (as it was commanded years before in her revelation, so it was now fulfilled). In committing herself to the Imago Transvesti, Kempe "fulfilt" several promises. God's Imago Dei is proven, the Bishop contingency is answered, Kempe's promise is fulfilled. In England, the established order could not see the truth in her Imago Transvesti, yet in Rome it has become visible for all to see. Once the Imago Mundi is seen beside the Imago Dei, society becomes jealous. 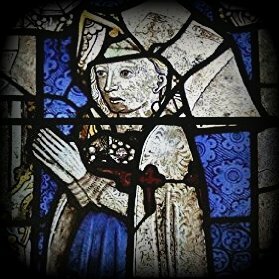 Soon after transitioning, Kempe became the target for a local priest, " He steryd meche pepyl agen hir and seyd mech evyl of hir, for sche weryd white clothyng mor than other dedyn whech wer holyar and bettyr than evyr was sche as hym thowt" (He stirred many people against her and said much evil of her on account of her white clothing; as if she deemed herself holier and better than others, he thought). The revelation of Imago Transvesti can conflict with the world that rejects it. Imago Mundi establish values and norms, setting certain embodiments in the center of its world and others on the margins. Imago Dei asserts a vision of the world where the margins can be centers of their own. As Kempe is told to reject all color from her white clothes, so the world feels the force of her rejection. Imago Mundi that judged and condemns her, now fears that she will judge. The secret of the Imago Dei in hagiographies is its constant insistence through the mutable Imago Mundi that can draw the saint into inconstancy. When in Rome, Kempe is introduced to a Dutch priest who convinces her to confess to him. He asks her, will you do as I bid? Yes, she replies. Having set her up with a promise to submit to any of his instructions, the priest charges her to leave her white clothes and wear black clothes. Kempe submits to the priest as an authority of the world and God, " than had sche felyng that sche plesyd God wyth hir obediens" (then had the feeling she pleased God with her obedience). For Kempe, norms are stronger when voiced by a churchman, when the Imago Mundi and Dei can purport to speak in one voice. Yet readers know the conflict. Bound by a new promise in contradiction to the old, Kempe is caught between Imago Mundi and Imago Dei; each asserting claims, insisting on her constancy and loyalty. Having abandoned normate motherhood and then trans virginity, Kempe is ridiculed for betraying both her masters. She has fallen into the position described in Matthew 6:24, "nemo potest duobus dominis servire aut enim unum odio habebit et alterum diliget aut unum sustinebit et alterum contemnet non potestis" (No man can serve two masters. For either he will hate the one, and love the other: or he will sustain the one, and despise the other). Just as Jesus is describing the jealous conflict between the worldly and divine, Kempe finds herself serving different masters who are giving her conflicting commands and images of herself. The transition back to a wife was most felt as a betrayal by those who had affirmed her virginity. Her friends in Rome could not understand why she gave up on the Imago Transvesti, asked her she had been robbed. No, she replied, then fled Rome. On the road, she runs into one of the priests that had opposed her transition to virgin and smugly applauds that she realized the foolishness of her Imago Transvesti, "he enjoyid gretly that sche was put fro hir wille and seyd unto hir, 'I am glad that ye gon in blak clothyng" (He greatly enjoyed she had been taken away from her previous choice and said, 'I am glad you have gone back to black clothing'). At the disappointment of her friends in Rome and the satisfaction of a man she considered her enemy, Kempe began to reconsider her choices. Before the priest could move on, she told him, "Ser, owyr Lord wer not displesyd thow I weryd whyte clothys, for he wyl that I do so" (Sir, our Lord was not displeased that I wore white clothes, for her wills that I do so). The Imago Dei has not abandoned her, and she has not entirely abandoned her Imago Dei. After submitting to the Imago Mundi, Kempe's life becomes more inconstant and full of conflict as Imago Transvesti constantly continues to assert its primacy. In the end, Imago Transvesti wins out against the inconstancy of Imago Mundi by asserting the constancy that Augustine describes, “if it is made after the image of God …certainly it always is.” Given her lack of peace during her return to her worldly identity as a mother it is not surprising that upon her return to Rome Kempe also returns to her virgin identity. The Book testifies that while she was in Rome a little before Christmas, our Lord Jesus Christ commanded her, “to gon to hir gostly fadyr, Wenslawe be name, and byddyn hym gevyn hir leve to weryn ageyn hir white clothys" (to go to her confessor, Wenslawe by name, and bid him give her leave to wear her white clothes again). Location and locomotion continues to function as representative of transition. Movement destabilizes her but Rome reasserts the fixity of Imago Transvesti. While she moves, Rome does not. While she changes, the Imago Transvesti does not. While before she confused the Imago Mundi and the Imago Dei as acting in the same voice, the voice of Christ disrupts and divides this conflation. In the end, the command from God overrules the command from a priest, "whan sche teld hym the wyl of owr Lord, he durst not onys sey nay. And so weryd sche white clothys evyr aftyr"(when she told him the will of our Lord, he dared not say 'no.' And so she would wear white clothes ever after). The jealous match between Imago Mundi and Imago Dei concludes here as Kempe comes to understand that obedience to the church is not always the same as obedience to God, especially when the church becomes the enforcer to worldly gender norms at conflict with Imago Transvesti. Imago Dei of Genesis may be used time and again to assert gender binaries and divisions yet are undone by living out the failure of these social constructs and experiencing the persistence of trans truths. Augustine. The Trinity. Stephen McKenna trans. 6.874. Biblia Sacra Vulgata (Vulgate): Holy Bible in Latin. “Matthew.” 6:24. Stuttgart, Germany: German Bible Society, 2007. Print.